the people and the communism! The new internet page, this mass electronic medium, named after one of the most prominent figures of Albanian nation– ENVER HOXHA, is only a modest attempt to preserve and cultivate His eternal legacy that we have inherited from Him. For the time being, you can only view only a fraction of his biography and probably asking yourselves why there is nothing else. The website is under construction and for technical reasons has not been completed, but not for very long. We have published this website to progress towards achieving our objective precisely on the day of 99th birthday of Enver Hoxha..
Open archives and make them public for all strata of the society! this internet webpage will be a catalyst for enlightenment, preservation and cultivation of the work of Enver Hoxha. Through this modern medium, we will attempt to enable all social strata to get more familiar with the written works of Enver Hoxha (currently a taboo topic in the Albanian territories). 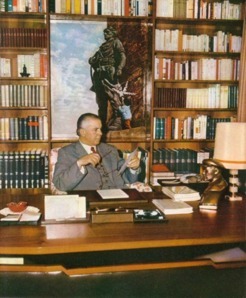 To serve this purpose we will publish in this internet site all works and books of Enver Hoxha. We leave it up to the judgment of the reader to form an opinion of them. We will release them without censorship. We will also attempt to bring forth authentic and original documents without commenting on them. This website will also contain a space reserved for young artists, who unveil their talent precisely on the page dedicated to Enver Hoxha. Dear reader, in our endeavor, we need your assistance. So, we urge you to write to us. We accept all criticism and we appreciate your valuable suggestions.